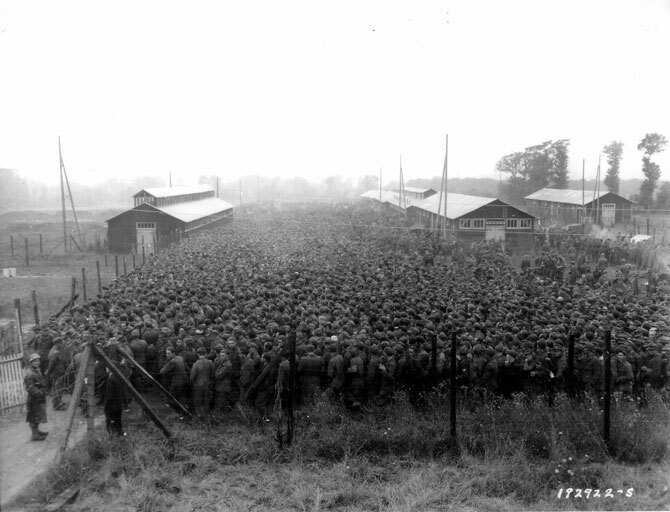 Thousands of German prisoners of war at Nonant le Pin POW camp after the Falaise Pocket battles in which over 30,000 Germans were captured. 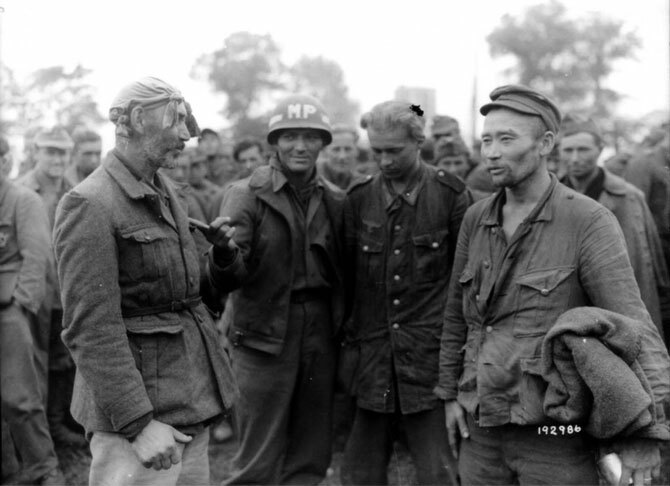 The Germans were captured following the Falaise Pocket battle in August 1944, with approximately 50,000 Germans trapped inside. Many Germans escaped but losses in men and equipment were huge. The photos showed the physical state of the German Army in the war. In almost all prisoner of war photographs, the Germans were in a decrepit state, overgrown hair, skinny, and sleep deprived. It was not the camps that made the soldiers look tarnished, it was just a continuation of their condition when they surrendered. 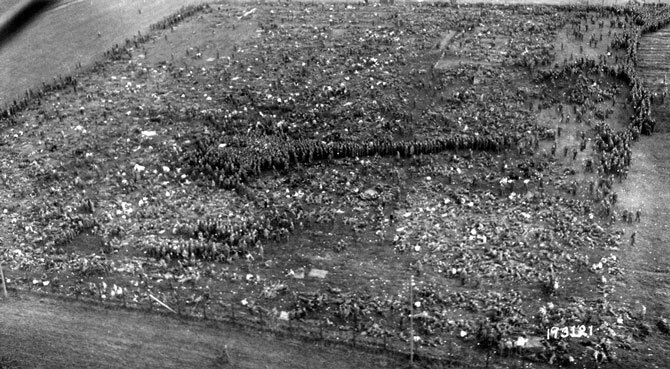 Some of the tens of thousands of POW’s captured after the collapse of the Faliase Pocket are seen from the air Nonant le Pin POW camp. The guard soldiers would get in a jeep, circle around the camp, and every so often they’d yell “Halt!” and shoot their guns in the air to give the impression escaping soldiers were being shot. But the escapes were rare, none actually, because these prison camps were protecting the prisoners just as much as they were containing them. Anyone who escaped that camp would likely have been recaptured by Allied forces, or caught and executed by Resistance or Resistance-friendly citizens. Most if not all of those men knew their chances were much better inside those fences. US Military Policeman poses with “German” POW’s Nonant le Pin POW camp. Many of the “German” troops in Normandy were in fact not German but from areas of the Soviet Union that included people from the far east of that country. Often they were originally conscripted into the Soviet Army only to be captured by the Germans in the huge encirclement battles of Operation Barbarossa in 1941. Those who volunteered for service with the Germans were termed Hiwis (short for Hilfswilliger) and were typically used for non combat positions such as working in kitchens and stables. The Battle of the Falaise Pocket ended the Battle of Normandy with a decisive German defeat. Hitler’s involvement had been damaging from the first, with his insistence on hopelessly unrealistic counter-offensives, micro-management of generals, and refusal to countenance withdrawal, when his armies were threatened with annihilation. More than forty German divisions were destroyed during the Battle of Normandy. No exact figures are available but historians estimate that the battle cost the German forces c. 450,000 men, of whom 240,000 were killed or wounded.